HomeLifestyleFashionDo Anti-Aging Spa Treatments Work? As our age changes some unavoidable changes in our body occurs and one of these is aging. Skin Aging is a denial of cycle of life. Our skin starts aging at our mid 20´s however the intrinsic aging is not visible for decades. There are many causes which contribute to aging like stress, facial expression, sleeping position, smoking etc. However the most common cause is sun. The unprotected sun ray´s damage our skin causing wrinkles and blemishes to appear. Even small amount of UV rays starts the process of aging. Everybody loves to look younger no matter what the year of life is going. There are many spa treatments available which help against the negative effects of aging and improve appearance. These spa treatments are beauty treatments and reverse the process of aging by reducing the influence of external aging factors. After using spa treatments people look younger than ever before. The beauty industry spends millions every year to meet the demands of the society. Spa treatments include facials which are deep cleansing of skin pores and help to rejuvenate the skin. It is done by exfoliating the dead cells. They moisturize skin and make it firm. Many men are also taking facial treatment to keep their skin healthy. Cosmetic spa treatment aids skin metabolism and restores the skin’s appearance and texture to younger stages. This is the very best in skin anti-aging. They enrich the skin with vitamins, minerals and many important elements. Botox like other spa treatments makes the skin look younger and healthier. It is injected around the eyes and helps to remove the wrinkles. It has many benefits over traditional plastic surgery and is cheaper as well. Everyone has a desire to look younger whether it is a man or a woman. Chemical peeling is one of those treatments which can make this possible. It is effective to treat acne, sun damage, fine lines, and mild scarring. They remove dull layer of skin and restore skin´s healthy glow. 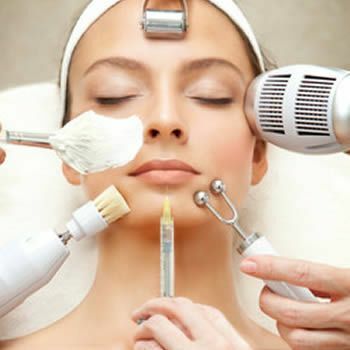 Microdermabrasion is advanced method of skin care by removing the top most layer of skin by gently exfoliating the cells while at the same time vacuuming the dead cells away. Removing the outer layer of dead skin cells leaves a smoother texture and promotes the growth of new healthy skin cells. Another spa treatment to reduce your age is photo rejuvenation in which skin is treated with intense pulsed light. It removes blood vessels, brown pigment, hair follicles and wrinkles. Sun damage, Redness and flushing is also treated with this technique. People enjoy more beautiful and healthy skin after photo rejuvenation. Laser skin tightening is another popular spa treatment with minimal side effects. With laser treatment skin tightens and pore size reduces. It also reduces wrinkles, improves elasticity, texture and makes the skin smooth. Vitamin C is another topical agent which is effective against wrinkles, fine lines and bleaching spots. A therapeutic massage definitely relaxes and soothes mind and body. A foot scrub can invigorate you. Therapeutic massages, facials, manicures and pedicures have psychological benefits too. Other spa treatments include injection of Restylane and Sculptra in cheeks and lips to make them plump, firm, fuller and younger. People choose spa treatment depending on their choice and budget. Though spa treatments are cheaper at spa´s salons than at dermatologist´s office. Spa treatments are truly unique and effective in reducing years of age. One does not need to go to the doctor for reducing signs of aging. It stimulates mentally and physically and increases your confidence. A trip to spa is not the waste of money and in this day and age where stress looms every second it is the cheaper way to get away.